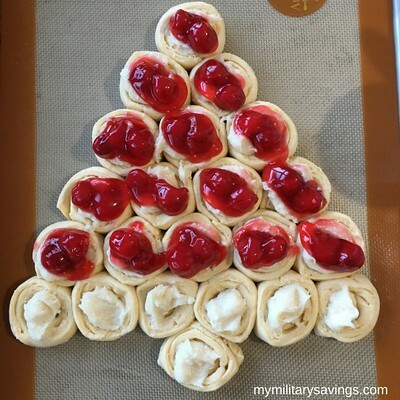 Looking for a quick and easy breakfast to serve in the middle of the Christmas morning chaos? Don’t have time to search the internet to find one? No worries! I’ve found one for you! 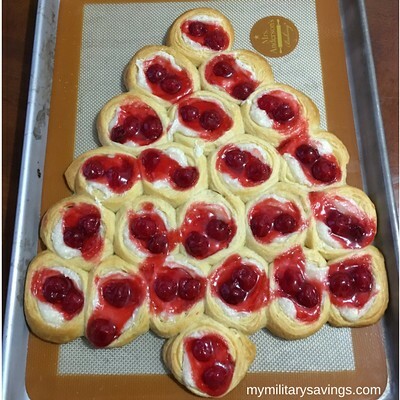 While browsing Pinterest searching for something festive to serve my guys, I came across this lovely little Christmas Tree made of danishes! The recipe is quite simple to put together and oh so tasty! You can find all the ingredients at your local commissary. 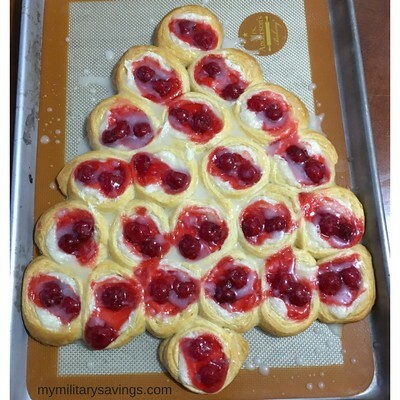 If the tree isn’t your style, you can shape these danishes into something else! I think I’ll make a wreath or even a star next time! Preheat the oven to 350 degrees. Open the crescent roll tubes, but don’t separate them. You’ll need 22 slices of crescent rolls. I scored mine with a knife before cutting just to make sure I’d cut enough. 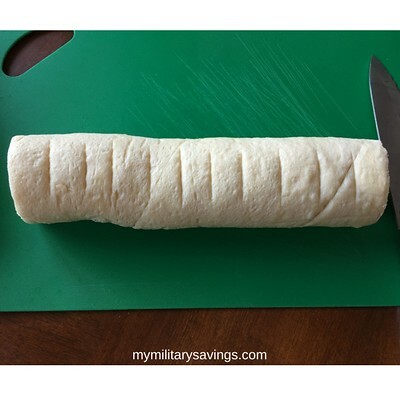 Use a serrated blade and gently cut your slices. 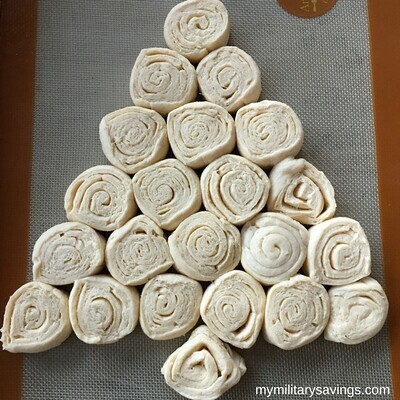 Arrange your rolls into a Christmas tree design. I started at the bottom with six and built my pyramid with one left over for the tree stem. So cute and festive! 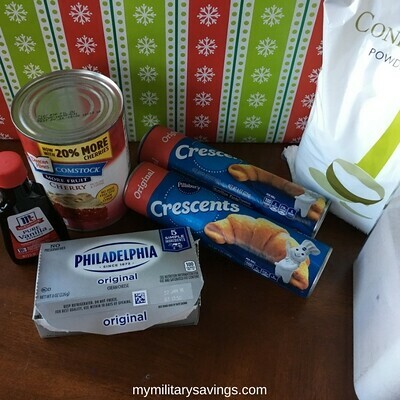 Mix the cream cheese with the granulated sugar and vanilla extract. 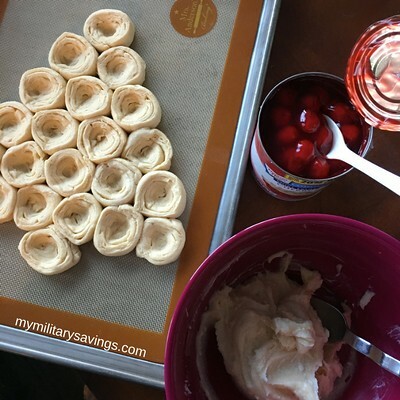 Create little wells in each crescent roll using the back of a spoon. Now you’ll add a spoonful of the cream cheese mixture to each well. Top the cream cheese with a spoonful of the cherry pie filling. You could use whatever pie filling you’d like! Pop it in the oven and bake 20-25 minutes or until golden brown. While it’s baking, combine the powdered sugar and milk to make your glaze. I had about half a can of pie filling and half the cream cheese mixture leftover. I stored them in a ziploc bag for another batch of danishes later! How pretty is this tree? It’s so festive and perfect for Christmas morning! Once it’s cooled a few minutes, drizzle the glaze on top and serve! Oh my gosh, guys. 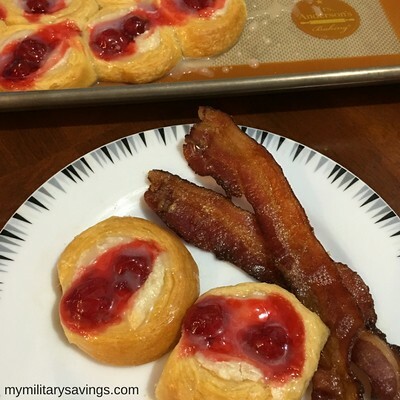 These danishes are SO GOOD! They’re creamy, sweet, tart, with the crispy buttery edge of the crescent rolls. Delicious. 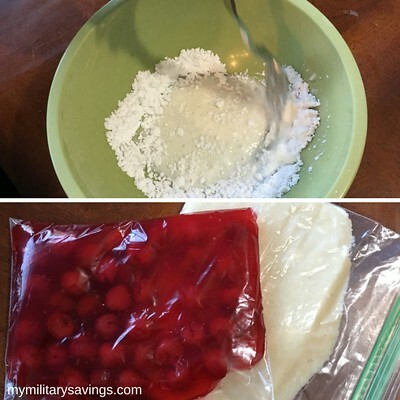 For more great recipes head on over to mymilitarysavings.com. 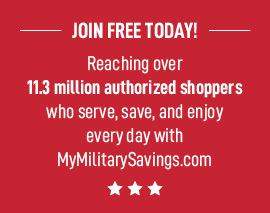 Membership is FREE so be sure to sign up today! « Don’t Just Give Out Ca$h This Holiday – Give These Clever Money Gifts Instead!